CELEBRATION IN THE WOODS IS CANCELLED FOR 12/15 DUE TO WEATHER. Join the Inner Arbor Trust, Inc. and Downtown Columbia Partnership, Inc. for a new Celebration in Merriweather Park at Symphony Woods! On Saturdays from November 24th to December 22nd from 11 a.m. to 5 p.m., the Chrysalis transforms into a winter wonderland, complete with artist-decorated trees, live performances, a “snow” ball pit, seasonal crafts, and winter treats such as hot chocolate, apple cider, mulled wine, and more! Santa will visit the Chrysalis at 3 p.m. Come join us for the magic of the season! 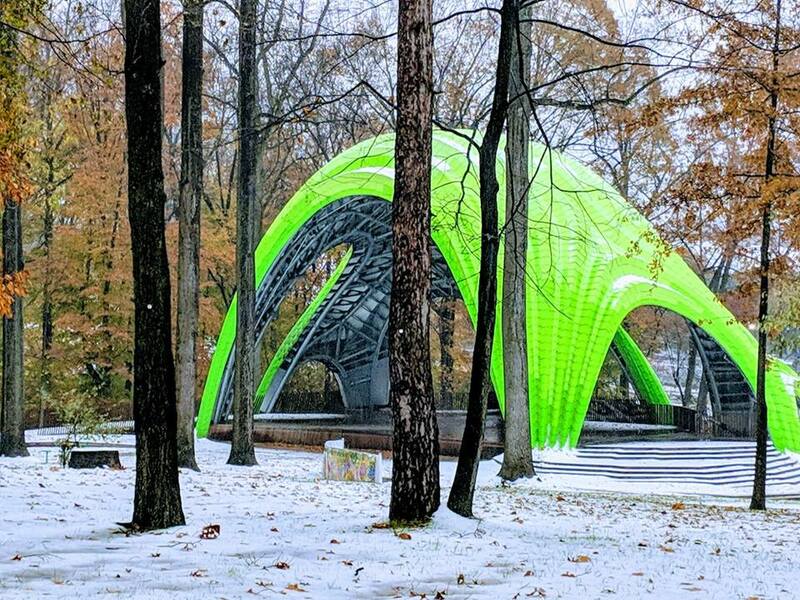 Join the Inner Arbor Trust, Inc. and Downtown Columbia Partnership, Inc. for Celebration in the Woods, a joyous, seasonal celebration of winter in Merriweather Park at Symphony Woods. Stop in for crafts, performances, and to enjoy our artist-created trees. Santa will visit from 3 p.m. to 5 p.m. daily. Tickets are $5 in advance and $8 at the door. Advance tickets are sold until 4:30 p.m. daily via Eventbrite. Children under 2 years old are free. From points north: Take 29 South to 175 West (Columbia). Continue as 175 becomes Little Patuxent Parkway. Take Little Patuxent Parkway to South Entrance Road, make a left. Make the first right onto Symphony Woods Road, then the immediate sharp right up a steep driveway (there is significant construction at this entrance, however, the drive to the Chrysalis is still open). Park in any numbered space. From points south: Take 29 North to Broken Land Parkway towards Town Center / Merriweather Post Pavilion. Make a right onto Little Patuxent Parkway. ake Little Patuxent Parkway to South Entrance Road, make a right. Make the first right onto Symphony Woods Road, then the immediate sharp right up a steep driveway (there is significant construction at this entrance, however, the drive to the Chrysalis is still open). Park in any numbered space.